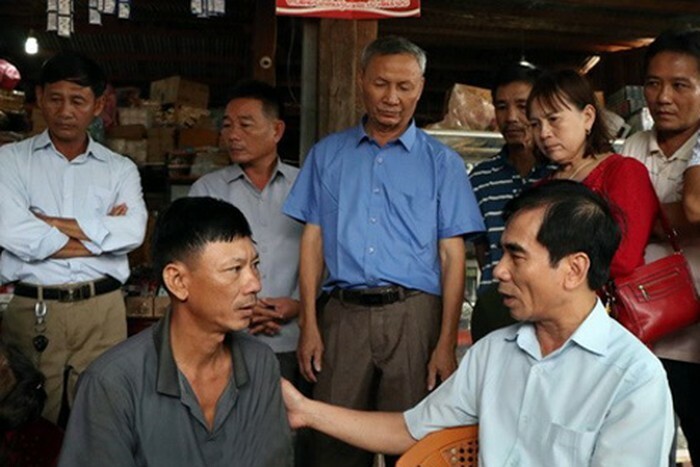 (VNF) – Dao Van Hieu, Vietnamese Consul-General in four provinces of Laos on July 27 visited Vietnamese families who were affected by the recent collapse of Sepien Senamnoi dam in Sanamxay district, Attapeu province. During the visit, Hieu took time to learn about the people's difficulties, including the loss of properties, houses, assests, as well as their current living condition and health. The diplomat also reminded the people to take good care of their health, in terms of both physical and mental aspect, as human's life is the most important asset. The Vietnamese affected families are currently staying in the residency of a Vietnamese Laotian named Vu Van Duong, in Mitsamphanh village, Sanamxay district. According to Consul-General Hieu, after the water decreases the Consular will provide affected families with adequate assistance to help restore their livelihood. Currently, the Consulate has been mobilizing aid from enterprises and individuals in four Southern provinces of Laos to support those needy households. On the morning of the same day, the Vietnamese Association in Attapeu province handed each affected family one million Lao kips and necessities goods. The collapse of Sapien Senamnoi dam on July 23 has submerged 13 villages of Sanamxay. It swept away thousands of houses together with residents’ assets. Since the disaster happened, the authority of Attapeu province has actively taken action in rescuing and searching for those who are still missing, delivering emergency neccesities to remote areas and other disaster relief work./.